Stations of the Cross will be held on Fridays durning Lent at 4 PM in the Church. Mission Statement: We, the members of St. Jude The Apostle Parish, are committed to living and proclaiming the Gospel of Jesus Christ and following the teaching of the Catholic Church. As the People of God, we recognize the universal call to holiness, rooted in Baptism and nourished by the sacraments, especially the Eucharist. We act in charity and justice as a visible sign of our mission to be a house of welcome and a place of service to all. The Parish Office and the Christian Formation Office will be closing at noon on Thursday, April 18 and will reopen on Tuesday, April 23. If you are looking for some Lenten resourses, you may find them HERE. This will include the digital video written and hosted by Father Richard J. Jasper, associate pastor of Saint Ann church in Wilminton. The series is designed to help people get the most our of the season Lent and prepare spiritually for the coming of the celebration of Christ's resurrection at Easter. Titled, “Holy Boldness: A Journey Through Lent with Four American Saints,” each 13- or 14-minute presentation will focus on the life of an American saint, or religious leader; Saint Elizabeth Ann Seton, Saint John Neumann, Saint Katharine Drexel, and Bishop Alfred Curtis. Digital videos will debut on Saturdays at 5 p.m. during the first four weeks of Lent (March 9, 16, 23, and 30) on the diocesan YouTube channel – YouTube.com/DioceseofWilm. The next morning at 6:06, the audio portion of the presentation will air as part of that Sunday’s “Catholic Forum” radio program on WDEL, 101.7 FM and 1150 AM. Immediately following the broadcast, the program will be podcast at cdow.org/CatholicForum and on Apple, Spotify, and iHeartRadio podcasts. Additionally, the diocese has established a web page, cdow.org/Lent, which will contain the video and podcast links, as well as additional free Lenten resources. 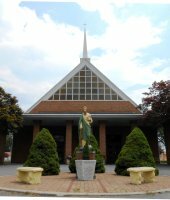 Daily Mass for April 15, 16 & 17 is at 8 AM (Monday, Tuesday and Wednesday). Holy Thursday Mass of the Lord's Supper is 7 PM, April 18. Easter Sunday masses are Sunday, April 21 at 7, 8:30, and 10:30 AM in the Church and 8:45 and 10:45 am in the Parish Life Center.